In our opinion SugarSync is one of the most comprehensive cross-platform cloud storage services, that's why it's exciting to hear that the folks there are deepening the partnership with Samsung for all of its AllShare Play-enabled devices. 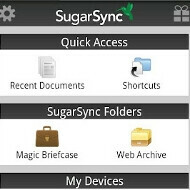 SugarSync has been included in the Smart TV line since January, and will now come to the venerable Galaxy S III. At SugarSync, we think the mobile experience is very important for users, which is why we have been the leader in mobile innovation for personal cloud and support more mobile devices and platforms than any other Cloud provider. Expanding our relationship with Samsung to be integrated into their mobile devices is a natural progression, as this will give Samsung mobile users a way of sharing content via the SugarSync Cloud across multiple devices from within AllShare Play. Check out our tabulated comparison of the cloud storage services below to get a good glimpse how SugarSync stacks up against the competition.